Why exactly should I use Buffer? If you’re working with individuals or companies and organizations on a website, they may likely be interested in social media. If that’s the case, consider telling them about Buffer. What it does is simple. You add updates to your Buffer queue and it will be posted for you well spaced out over the day – and at the best times. It’s like your magic box you can use anytime to fill with great Tweets, Facebook stories or LinkedIn updates. Just drop them in and you don’t have to ever worry about when it will be posted, it’s all taken care of by Buffer for you. In major news reader apps like Pocket, Instapaper, Google Reader, Reeder, IFTTT, etc. As an extension for your browser, you can buffer any page by clicking a button or even using keyboard shortcuts (Alt+b for instance). The option to “buffer” shows up in other neat places, too, like Twitter’s tweet box. 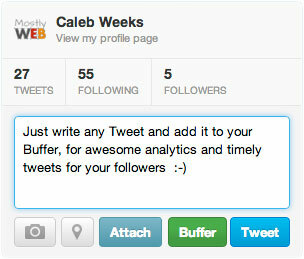 Start Buffering normal Tweets, so you can get all the additional analytics that Buffer has available for you. This includes the number of retweets, clicks on links, mentions and favorites all saved for you. While exploring Buffer’s extra’s page, you may discover new tools and apps like Pocket or IFTTT. In essence, Buffer is worth checking out. If you’d like a “Quick and Fun Introduction to Buffer” written by the Buffer guys, read on.